Safe Stout - the fun & games of brewing it — Weird Beard Brew Co.
Good brewing involves a healthy dose of craftsmanship amongst other things. When you’re witness to good craftsmanship that often brings inspiration to the table. So, when a good idea knocks us on the head there very well may be an element of building on top of something that we already know works. And this, we’re happy to admit, is how Safe Stout came about. We brewed our Christmas beer, a Cranberry Stout called Black Christmas, last year and found the juiciness of the fruit made for a satisfying and flavourful beer that outshone all those too potent with sickly Crimbo spices. We found the red-fruit notes worked really well to lighten the darker and roasted malt flavours and was something worth us remembering for future brews. (We do log a lot of ideas that come to mind and would make for a great beer, should we have space in our brew schedule and revisiting the list of sometime whacky and sometimes simple recipes is always a lot of fun). 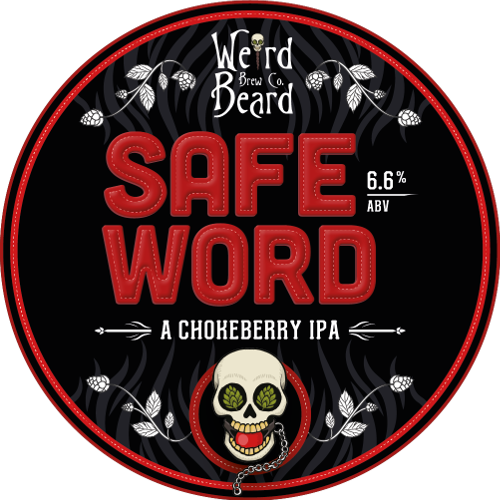 In the same year, we had also brewed Safe Word, a fruit IPA with slightly tart chokeberries. With this recipe, we discovered that the fruit aromas and taste of Mosaic hops really sung when used in conjunction with the chokeberry. With both these tasty brews under our belt, it wasn’t too long before we found ourselves driven to do a dark version of Safe Word. Using a very similar grain bill to Black Christmas, except for accommodating for the same ABV ballpark as Safe Word, we pretty much had a solid recipe at our fingertips. We experimented a little with the quantities of fruit in the recipe re-write, to get the level of juiciness we wanted in a darker beer. We also dropped out the dry hops we had for Safe Word when making Safe Word to ensure the richer, stouter flavours still had prominence. Both beers rock playful, gimpy Lup’ins which to us, represent the fun-loving, no holds-barred ethos we have regarding brewing. They also represent the out-of-the-ordinary, little-bit-daring nature of our brewing with an odd fruit called chokeberry as well as the recipes we like to have some fun with. If you want to know more about chokeberry, a.k.a Aronia, read here. As with our chokeberry IPA, Safe Word, when drinking this beer you’re guaranteed the same punchy chokeberry delivering tart, red-fruit notes. Tie in the aforementioned, juicy Mosaic hops to play on that, and also subdue some of the fruit's bitterness, this beer goes down far too easy for 7%. All the while that you’re relishing these flavours, you’ve also got melt-in-your-mouth chocolate and a silky mouth-feel desired of a delicious stout. With great pleasure do we share this beer with you. Cheers!